Week 3 | Whole Food. Real Food. Good Food. Week 3: We switched from Canola Oil to Coconut Oil & Olive Oil. We switched from butter to Ghee. One of the “good fats,” which makes up about 50 percent of coconut oil, is lauric acid. Lauric acid is a rare medium-chain fatty acid found in mother’s milk. It is now being shown to have anti-fungal, anti-viral, and anti-bacterial, health-protecting properties. Some researchers predict that lauric acid will one day become as well known in health circles as omega-3 is today. As studies reveal the downsides of consuming too many omega-6 vegetable oils with their saturated fatty acids, coconut oil is making a comeback. Benefits of coconut oil: Strengthens immune system; boosts key mineral absorption (calcium and magnesium); anti-fungal and antibacterial; provides long lasting energy; great for skin and hair (internally and topically); reduces risk of atherosclerosis and heart disease; reduces risk of cancer and other degenerative conditions; helps control diabetes; improves digestion and nutrient absorption; supplies important nutrients necessary for good health; promotes weight loss; functions as a protective antioxidant; healthiest oil for cooking. Coconut oil is obtained from a coconut. Canola oil comes from the rapeseed plant, but wild rapeseed contains erucic acid, which is toxic. Rapeseed oil was so toxic that the FDA banned it for human consumption in 1956. So when Canadian growers bred a new variety of rapeseed in the 1970s with a lower content of the toxic erucic acid, they decided they needed a new name for it. The term canola was coined from “Canadian oil, low acid” to convince consumers that this oil was safe to eat. Over-consumption of oils like canola cause an abundance of Omega 6 fatty acids — this imbalance increases the risk of inflammation, heart disease, obesity, and prostate and bone cancer. – Information Provided by Natural News. Vegetable and seed oils, like corn oil, are predominately linoleic acid, which is an omega-6 fatty acid that easily turns rancid. If you have too much omega-6 in your diet, you develop chronic, systemic inflammation. I first used coconut oil to make my husband his fried eggs. He didn’t notice a difference until I told him — he then said he tasted a faint hint of coconut. I use it in all of my baked goods and cannot tell a difference. It comes in solid form and will melt very quickly on the stovetop or microwave when needed for a recipe. When using it for baking, eyeball the correct amount and place into glass measuring cup. Place the measuring cup in the microwave until melted, add or remove oil as necessary. If removing oil from the measuring cup, you can pour it back into your coconut oil container, it will harden back up. Here are some great tips on using coconut oil. We also use olive oil. New research suggests that virgin and extra-virgin olive oils that are not chemically processed contain antioxidants called polyphenols (also found in red wine and green tea). Polyphenols mop up free radicals before they can oxidize LDL (oxidation makes LDL even more damaging to arteries). Not all olive oil is created equal! Many olive oils are cut with cheaper oils, such as hazelnut and sunflower seed. When shopping for olive oil, certain characteristics of labeling and bottling suggest (though they don’t guarantee) high quality: a harvest date (as opposed to a meaningless “best by” date), a specific place of production and producer, mention of the cultivar of olives used, dark glass bottles (light degrades olive oil), a D.O.P. 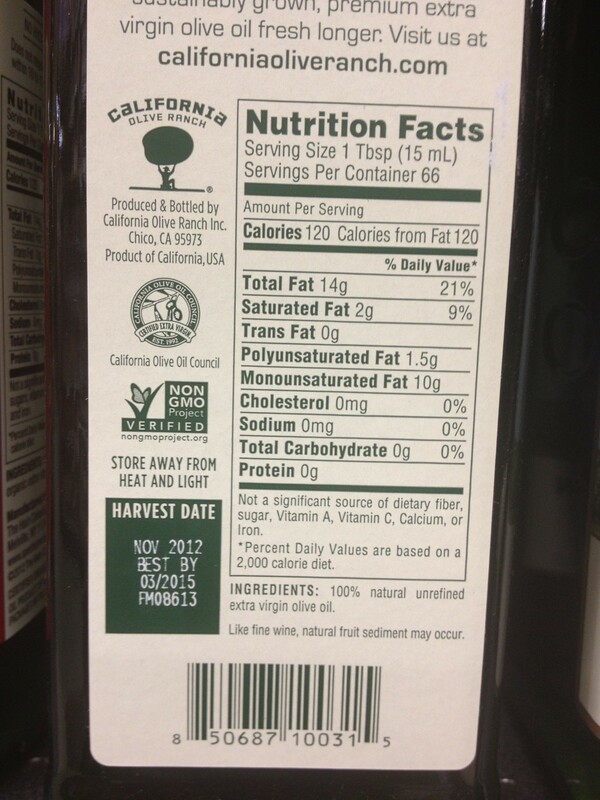 seal on European oils, and a California Olive Oil Council seal on oil made in the U.S. Read more here. 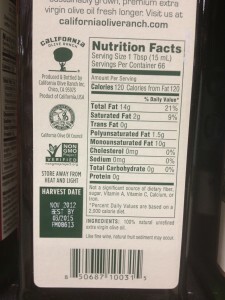 Fortunately, there are a number of simple ways to determine if you have purchased fake olive oil. Look for the International Olive Council (IOC) label of authenticity. Imported olive oils that bear official IOC labels of authenticity generally undergo strict quality control testing. Buy local. US growers and manufacturers are often held to stricter standards than companies that export to the United States. 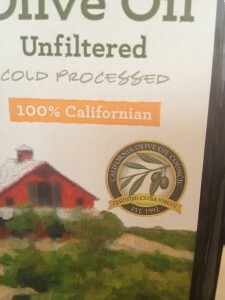 The California Olive Oil Council (COOC) seal is a good one to look for. Refrigerate your olive oil. If authentic, olive oil will thicken and become cloudy. See if your olive oil is flammable. Real olive oil is flammable. Try putting it in a fireproof pan and lighting it with a match. If your olive oil does not burn, it is most likely not real. Check to see if it bears the Non-GMO Project seal. The Non-GMO Project rigorously evaluates companies before verifying their products. Look for your favorite brands here. We put Extra Virgin Olive Oil in our Misto Stainless Steel Olive Oil Sprayer in place of our Pam cooking spray. It is great to spray on veggies when roasting them in the oven. When heating fats, the smoke point needs to be taken into consideration, because a fat is no longer good for consumption after it has exceeded its smoke point and has begun to break down. It is believed that fats that have gone past their smoke points contain a large quantity of free radicals which contribute to risk of cancer. Refining oils (taking out impurities) tends to increase the smoke point. Extra Virgin Olive Oil has a ballpark smoke point of 325°F – 375°F, depending on the quality of the oil. Thus, we do not raise the temperature past 325°F when using extra virgin olive oil. Avocado oil has a ballpark smoke point of 520°F and is similar in composition to olive oil, which makes it a great choice for this dishes cooked above 325°F. We switched from butter to Ghee. Ghee, also known as clarified butter, is made by a simple process of gently simmering butter to remove potential allergens such as casein and lactose. What remains is the pure butter oil, which promotes good helath and longevity. Ghee is a natural source of CLA (Conjugated Linoleic Acid) and the important fat-soluble vitamins A,D and K2 that are critical for maintaining good health. CLA slows the progress of some types of cancer and heart disease and appears to help reduce body fat and increase lean muscle mass. We use Grassfed Organic Ghee. The only ingredient is 100% Organic Butter. Doesn’t burn easily. 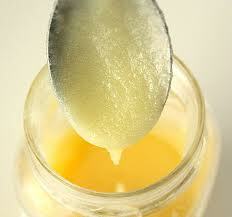 Butter quickly scorches at high temperatures due to its milk solids but ghee can withstand high temperatures. Ghee is stable at higher cooking temperatures, with a smoke point at 485 degrees Fahrenheit, which makes it ideal for cooking, frying or sautéing. Longer shelf life (6-8 months). Ghee can be stored for a long period of time, longer than butter can, and it doesn’t need to be refrigerated when it is stored. Allergies. Ghee is lactose-free because all of the milk solids are skimmed from it, which makes it suitable for lactose intolerant people who cannot use butter. There are many people who believe that ghee stimulates the digestive system and actually causes people to lose weight just by eating it. Ghee is a better choice of fat than butter and other saturated fats because it has a distinctive healing property not found in other fats. According to the Ayurveda tradition, ghee enhances the ojas, an essence that governs the tissues of the body and balances the hormones. Sufficient ojas in the body ensures a strong mind and body and resistance against disease, and is essential for longevity. The healing benefits of ghee are so high that Ayurveda deems it to be a pre-eminent healing food that helps in overall health and well-being. When I first introduced ghee into our kitchen, I used it on toast, held my breath and hoped no one noticed. They didn’t! I then started using it in place of butter for everything. We use it to grease the pan for pancakes, use it in baked goods, use it to cook veggies on the stove and anywhere else we normally would have used butter. It is very convenient because it is always soft and does not need to be refrigerated, so we always have soft butter when we need it. Both margarine and butter have the same amount of calories. Butter is slightly higher in saturated fats, at 8 grams compared to 5 grams. Eating margarine can increase heart disease in women by 53% over eating the same amount of butter, according to a Harvard Medical School study. Eating butter increases the absorption of many other nutrients in other foods. Butter has many nutritional benefits, where margarine has a only few, because they are added. Butter tastes much better than margarine, and it can enhance the flavors of other foods. Butter has been around for centuries, where margarine has been around for less than 100 years.